The Manila Bay Photo Contest ~ Philippine Freebies, Promos, Contests and MORE! 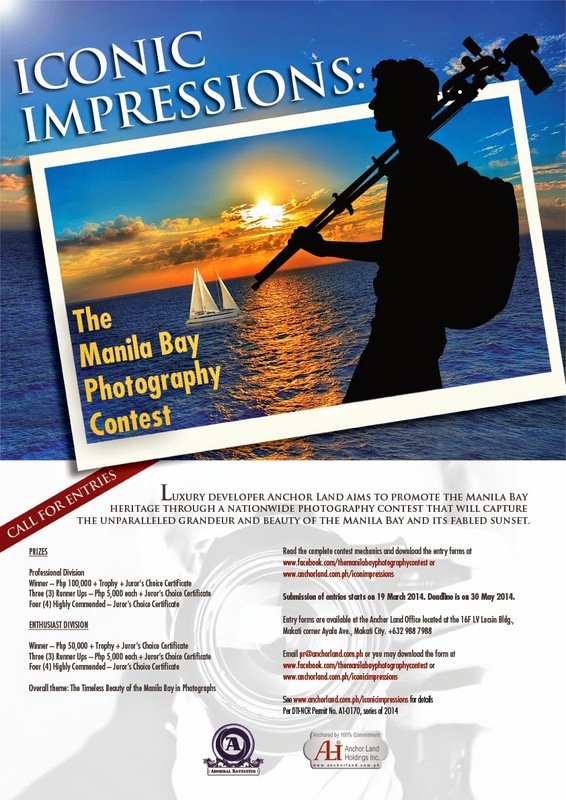 The luxury developer Anchor Land Holdings Inc is calling all photographers to submit your entries to the Iconic Impressions: The Manila Bay Photo Contest. Running on the theme: "The Timeless Beauty of the Manila Bay in Photographs", capture the unparalleled grandeur and beauty of Manila Bay and its fabled sunset and share it to the world. Choose your category between Professionals or Enthusiasts division. Submit your best shot for a chance to win P100,000 + Trophy + Juror's Choice Certificate in each category. There will also be three (3) runner ups who will receive P5,000 each + Juror's Choice Certificate. Four (4) Highly Commended entries will also be awarded with Juror's Choice Certificate. Theme: "The Timeless Beauty of the Manila Bay in Photographs"
16F LV Locsin Bldg., Makati Ave.